Then I had to decide what to have with the beans, since a pot of beans by itself isn’t really a meal. Then I remembered that I had a jar full of brown rice in the cupboard! Beans and rice is a classic pairing, but the dish was still missing something. I started digging around in the (very full!) freezer and discovered half a bag of frozen corn just waiting to be used up. Perfect! I mixed them all together, added some dried cilantro and chili powder, and topped the whole thing with a little grated cheddar, salsa, and guacamole, and dinner was complete! And if you’re wondering…yes, the rice boiled over. It always does. If you’re using dry beans, give them a good rinse, and soak them for an hour or so before you plan to begin cooking. (If you’re using canned, just rinse them off before you start cooking.) Put your beans in a medium-sized pan on the stove, add the quarter bouillon cube (more or less to taste, but I find them to be really salty), and add enough water to cover the beans by about 3/4 of an inch (less if using canned). Over medium heat, bring your beans to a boil, and then reduce the heat, cover them, and simmer until they start to get soft. Then uncover them and continue to simmer until the beans are fully cooked and most of the water has boiled off. With dry beans, this process should take about an hour, maybe less if you like your beans a bit harder. With canned beans it will take a lot less time since they’re already fairly soft and you really just need to heat them up. Meanwhile, put your rice on the stove to boil, and try to time it so that it gets done at about the same time as the beans. The rice I had takes a good 45 minutes to cook, so I started it not long after the beans went in. Keep an eye on the rice so it doesn’t boil over and make a mess all over your stove! 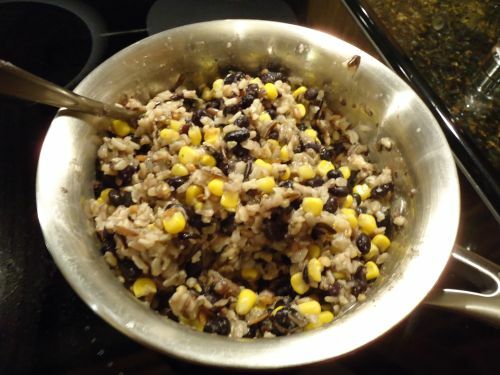 When the rice and beans are almost done, thaw the corn in the microwave. It doesn’t have to be hot–it will warm up plenty when you add it to the beans and rice–you just don’t want it to be frozen. Once all three components are ready, combine them all in whichever pot happened to be biggest, and season with salt, chili powder, and cilantro to taste. Top it with any combination of cheese, guacamole, sour cream, or salsa, and enjoy!